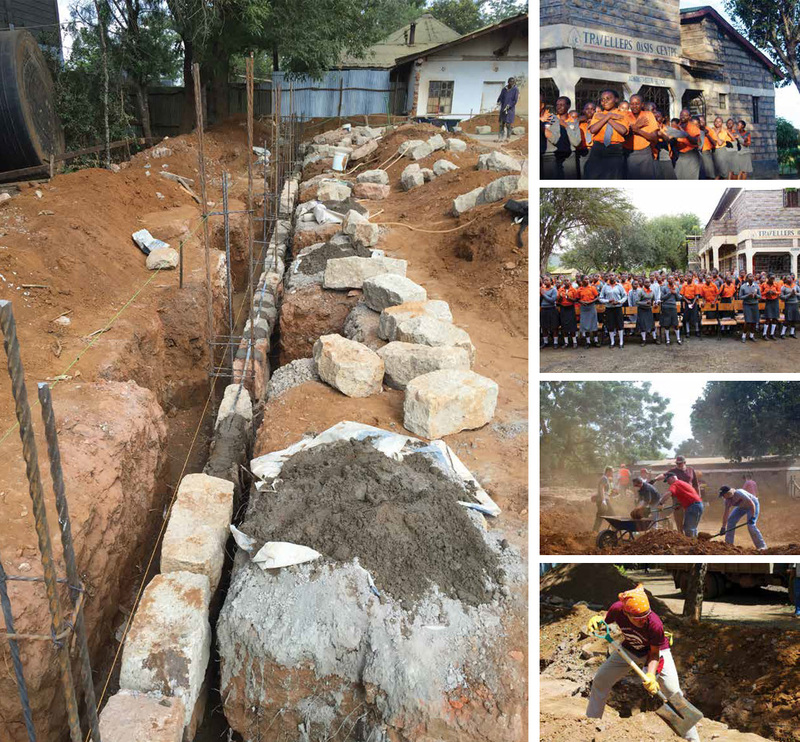 POET team members return to Kenya to start construction on the new kitchen and dining hall. Four years have passed since POET’s first interaction with Travellers’ Oasis Centre (TOC), an all-girls boarding school in the town of Sultan Hamud, Kenya. Since that time, 84 individuals have traveled over 8,000 miles as Mission Greenhouse team members. I am fortunate enough to be part of this team and have represented Mission Greenhouse during two trips. Our mission is to nourish the souls, minds and bodies of some of Kenya’s brightest, but most vulnerable girls by providing them with a quality, faith-based education in a safe environment. TOC is located in Sultan Hamud, a small market village, situated halfway between Kenya’s capital city of Nairobi and the port city of Mombasa. The two cities are connected via a rutted, two-lane road, over-run with semis hauling products inland and buses crammed with travelers. Imagine driving from Chicago to St. Louis in bumper to bumper traffic, with no designated passing lane, and vendors lining the streets selling everything from homemade sling shots, fresh fruits to chilled bottled water. Our journey began along this road as we departed Nairobi, eyes focused on the landscape outside. We left the hazy Nairobi sky behind for the wide open spaces, where you may see a giraffe off in the distance or a zebra along the road. Like the United States, shops and hotels are under construction, but after a closer look, you’d notice the scaffolding is made of branches and twigs, with no cranes or heavy equipment in sight. That’s when it started to sink in that I was finally back in Africa. Back in the place that forever changed my heart. Back at the school that laid a foundation for service and compassion within the souls of many, thanks to the vision Jeff and Tammie Broin saw and implemented back in 2012. Before our team began our work at TOC, we traveled to Amboseli National Park for an entirely different adventure. With Mount Kilimanjaro as our backdrop, the 2016 team began to develop relationships with one another and enjoyed the sight of elephants just yards away. We shared our greatest fears and our heartfelt hopes for the trip while sitting around a bonfire under the stars of the Southern Hemisphere. Check that off the bucket list. After two separate game drives, we began the bumpy trip back to Sultan Hamud where 150 girls were waiting, lined up and ready to greet us. The anticipation of this reunion was almost too much to handle and for those who were experiencing it for the first time, their joy was immeasurable. The collective sound of 150 voices singing in unison takes your breath away – there is something special about their enthusiasm, unabashed in their passion and unashamed of dancing in front of a group of foreigners. We may not have known the words to their songs, but in that moment, words and language didn’t seem to matter. Their songs and poems proclaim the transformative power education offers to these girls’ futures. If it weren’t for TOC, many would have been married off at a young age, or potentially subject to the brutality of genital mutilation, even forced onto the streets and into prostitution. The struggles and obstacles these girls have overcome just to have the opportunity to be in school, stand in front of our team and share unbridled love and affection for each one of us, is truly inspiring. I remember myself at their age, complaining about being involved in too many extracurricular activities and counting down the days until I could drive independently. My upbringing is markedly different than the childhoods these girls experienced, but their contagious smiles make all of these differences irrelevant. Our histories help shape us up to this point, but it is our interactions with one another that will help shape our futures, regardless of what nation we call home. These bonds cross borders. There are several definitions of the word foundation, but two in particular stand out to me: 1) the basis or groundwork of anything and 2) the act of founding, setting up, establishing. During this trip, we laid the foundation for a new dining hall which will be able to seat 400 girls and new kitchen which will be able to cook for even more. Work days were filled with hard labor – moving dirt, pushing wheelbarrows full of concrete, carrying block and moving more dirt (sometimes back to the spot we originally moved it from, but when in Kenya, do as the Kenyans do). Even amongst the sweat and sometimes frustration, we felt the power and the potential this new building will provide. Team members were encouraged to find a memento to permanently rest in the foundation – a family picture, a letter filled with love or meaningful trinkets. 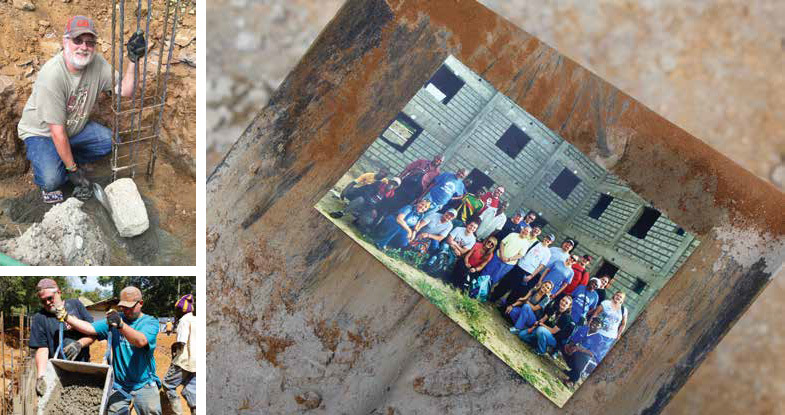 As we were preparing to set the first foundation block, we placed photos of the previous Mission Greenhouse teams next to it and it was almost too much for me to handle. In that moment, I knew the foundation we were building was only possible because of the work the Mission Greenhouse teams of 2013, 2014 and 2015 did before us. A group of us gathered around the area and watched cement and mortar cover up the photos, knowing that we were now part of something much bigger than we ever imagined. Part of a foundation which has the potential to lay the groundwork of everything. Later on in the week, I had the opportunity to sit in on a Form 4 (12th grade) chemistry class. The teacher, Benson, handed me a test tube full of a bright blue liquid and told me it was copper. I’m sure I did something similar a half dozen times in AP Chemistry my senior year in high school, but this time, holding something so elemental felt different. I sat and watched as my chemical reacted to different quantities of another chemical, watched as something was fundamentally transformed by another agent. I looked around the room and understood these seniors had transformed just as much as the copper I was holding, thanks to the foundation TOC has built. The week culminated with a dedication ceremony for the dormitory Mission Greenhouse built in 2014 and 2015. We gathered around the cornerstone, held a ribbon cutting and excitedly (and emotionally) followed the girls around the beautiful, colorful place to rest their heads. I couldn’t help but shed tears with the girls – tears of joy, not sadness, which are a bit new to the Kenyan culture. 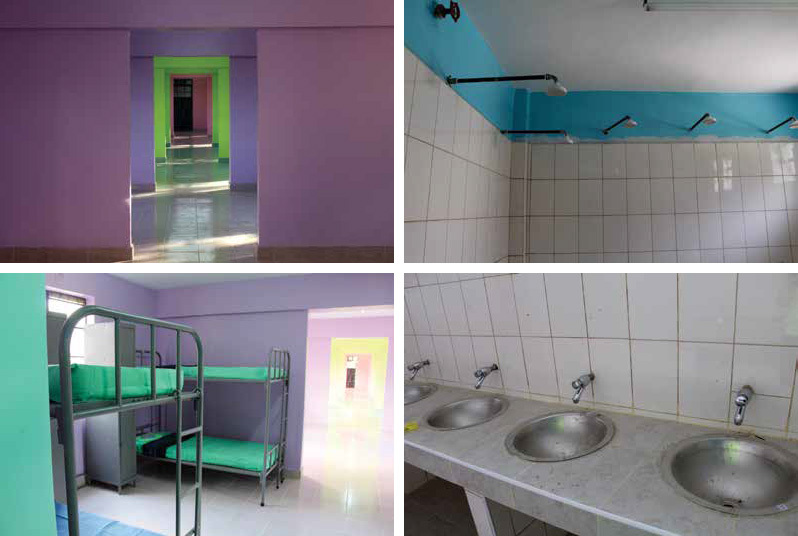 Looking at the dorm, looking at the girls and looking at our Mission Greenhouse team, I knew this was more than a building where 150 girls will live and learn. It is a physical symbol of the passion and dedication each girl has to her education and love Mission Greenhouse has for each girl. We ended our time at TOC in song and dance, jointly celebrating all of our blessings. One of the final songs we sang with the girls was the traditional hymn, “My Hope is Built on Nothing Less” and I’ve been humming it ever since. My hope for the girls at Travellers’ Oasis Centre is built on nothing less than knowing these girls will change the world. My hope for Mission Greenhouse is built on nothing less than to continue building foundations which give others a solid rock to stand upon. My hope for Esther and Shadrack Muiu, the school’s founders, is built on nothing less than knowing they will never give up on one another and never give up on a single girl who has or will enter the school’s gates. These are the solid rocks I choose to stand on. All other ground is sinking sand.